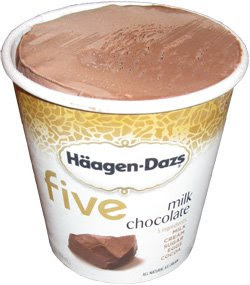 Hard to believe it has been almost 3 months since I first tried Haagen-Dazs five. As you may remember, I had a painful experience with the brown sugar flavor. It was so bad that I don't believe I gave the milk chocolate flavor a fair shake. So, now, with those other reviews a distant memory, I go in for the rescoop (courtesy of free coupons from HD). I was hungry and dinner was a good half hour away, and this can be one of the best times for a small bowl of ice cream. I take a few bites and it's not bad. I take a few more bites, and, I'm just not impressed. I take a few more bites and this flavor just can't win me over. I don't know what it is. Maybe I keep expecting to be knocked off my socks like before. I feel like I should be blown away, but I'm not. It has lower calories than the regular HD stuff, but that just isn't enough for me. The flavor just doesn't satisfy the basic chocolate desire in my brain. I feel bad because I can't elaborate more. I'm going to take everyone's suggestions and try some of the other flavors. I still have hope for the this line, so we'll see what happens. On Second Scoop: Don't get me wrong, it's not that this is a bad product, but I think it should be renamed cocoa, not milk chocolate. My experience with cocoa is that it has a dry nature, and that comes across here. I'm sure plenty of you will love it, it's just not for me.